The writers Sara Majka (Cities I’ve Never Lived In), Annie Harnett (Rabbit Cake), and Asako Serizawa (two-time winner of the O. Henry Award) are distinct voices, but all three have in common that they write movingly about the tension between the private and public lives of women. 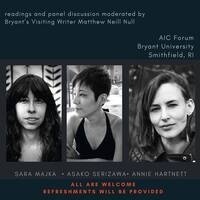 They will present short readings of their work, then take part in a panel discussion moderated by Bryant’s Visiting Writer Matthew Neill Null; students, faculty, and community members are also invited to take part in the Q&A. This event is co-sponsored by the English & Cultural Studies Department, the Hochberg Women’s Center, and the Women, Gender, and Sexuality Studies program. What a fantastic event! The writers were engaging, funny, and inspiring. I would love to see more of this kind of thing at Bryant.